During Donald Trump’s recent state visit to the UK, protesters carried an inflatable baby Trump blimp to bring humor to their protest of his domestic and foreign policy. Humor, in various forms, has a long tradition in protest movements. Humor’s ambiguity can catch audiences off guard, spark discussion, and bring attention to important issues in ways different from how logical argumentation would. 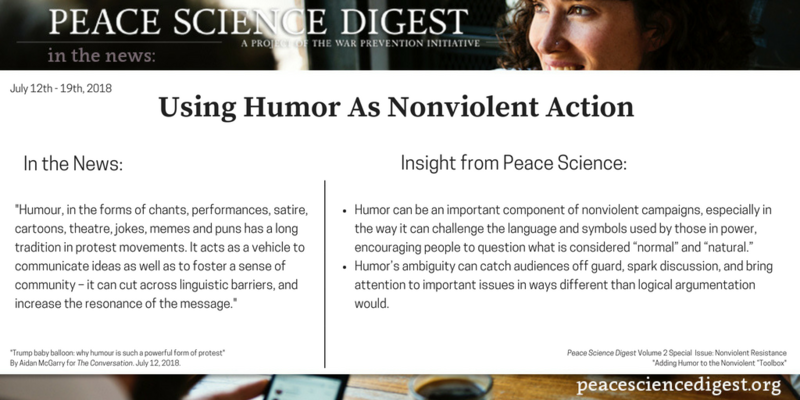 While humor may contribute to the effectiveness of nonviolent action along some dimensions, it may detract from it among others. “Trump baby balloon: why humour is such a powerful form of protest” By Aidan McGarry for The Conversation. July 12, 2018. Next article The 20 Year War Between Ethiopia and Eritrea Has Ended, Restoring Contact Between Separated Families.